Home safe and sound! As much as it was hard leaving the Florida family, there was Washington family eagerly awaiting my return. And as hubby reminded me, this is where I belong. Just wish the two branches of the family tree were closer. The trip home was uneventful, but reminded me again how much I hate flying. I’m still reeling a little from jet lag and although I was really looking forward to the cool weather and I still absolutely love it, I can’t seem to get warm today. I think my blood thinned out! After catching up with mail and unpacking the bags, I took a look at my projects. Three weeks of plain stockinette stitch left me wanting something a little more challenging. So, I picked up the Forest Path Stole and have been working on that. I just finished tier 18 and flirted with the idea of stopping soon. But I’ve come this far and I need to not bail at this point! No sense posting a picture, because it looks just the same as last time, only a tad longer. If you want a look, go on over to Ravelry – my user name is MissouriStar. I had started out with a different user name and then had a "duh" moment wondering why I didn’t use my blog name. Bless Casey’s heart – I emailed Ravelry and he changed it! And I’m trying so, so hard to refrain from casting on something new although there seem to be several different projects calling to me. I don’t think it’s the projects themselves, but just the lure of something new. Back to work on Monday and then off on Tuesday (pretty tacky, huh?) for the Elsebeth Lavold class. I’ll be sure to give you a complete report. I guess that was technically my first lace project! welcome home. The pictures are great. Thanks for the laugh. It’s so strange to see our granddaughters looking like little girls instead of toddlers. Ivy looks well fed, well dressed, and very well loved. How cute is that baby in that vintage lace??? Wow, the baby sweater set has certainly passed the test of time; it is just beautiful. The pj’d ballerina brings memories of my daughter’s long ago fashion quirks. What? No Columbus Day off to stretch out the vacation? Hee! I guess I need to go buy a yellow tutu to wear with my wool socks! Just friended you over at Ravelry. Took a minute to realize there is no space in Missouristar. Beautiful photos….LOVE the red socks! My comments are working, my comments are working! Welcome home to the dreary PacNW. Feels more like November. Beautiful girls, beautiful knitting in both the sweater set and the blanket. I love the outfit, and I wouldn’t want to be the one to tell Izzy that those socks have to be washed. 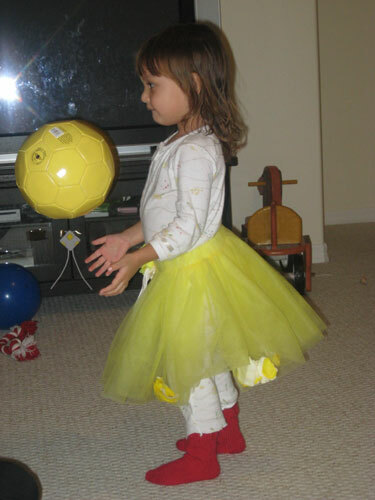 That is the sweetest thing ever…the yellow tutu with red socks! 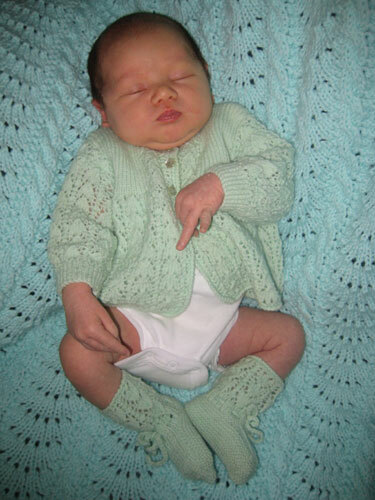 Or, is the baby Ivy wearing her daddy’s sweater the sweetest thing ever? I just can’t decide! Welcome back to the Left Coast! At least we don’t have alligators here, even if you’re freezing to death. That sweater set on Ivy is just adorable. Love that fashion statement!! Both are precious photos – of course – such precious babes – what else could they be! !